Act now and receive a $.50/sq. ft rebate on all Mirage Hardwood Floors. 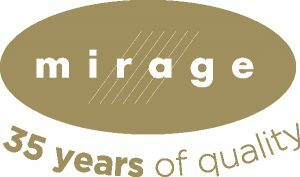 Mirage Hardwood flooring is an industry leader with over 34 awards for excellence over the last 10 years! Mirage is designed and manufactured in North America and is synonymous with superior quality, beauty and durability. Visit our Morristown showroom to see the extensive combination of colors, widths and species of hardwood we offer and ask us about the 35 year warranty! Wood flooring is always a classic. It can add warmth and a timeless feel to any room in your house. Wood flooring is appropriate for almost any décor, whether modern, traditional, or something more whimsical, and it is easy to maintain. Hardwood flooring offers natural elegance and beauty. Many varieties will add value to your home. Real hardwood lasts a lifetime, though it is susceptible to wear and tear, especially in high traffic areas. It can be refinished when necessary to restore its luster and shine. It is, however, more costly to install than alternative flooring options. 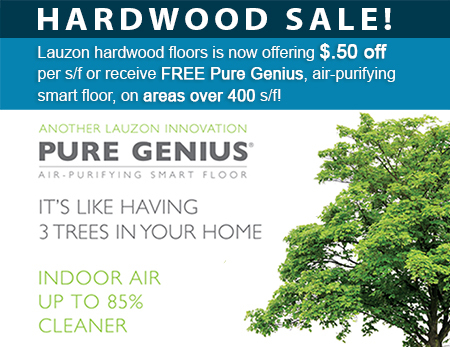 Improve your personal and home’s health with better air quality while enjoying the beauty and distinction of our Lauzon flooring selections. As a cost-effective alternative to hardwood, engineered wood is made from several layers of plywood that are fused together using heat and pressure. The top layer is solid wood, and the multiple layers of plywood create a strong, stable core. This composition is also a more eco-friendly option than solid hardwood. Engineered wood planks are available in a variety of thickness levels, species, stains, and surface treatments, making them more versatile than traditional hardwood. The planks can create a seamless transition between flooring material types. Engineered wood is also less likely to expand or contract and can withstand moisture and humidity prone areas like the basement. The price of an engineered wood project largely depends on the species and thickness of the planks. Installation can involve glue and nails like traditional hardwood floors, or the planks can be attached to one another as a floating floor installation. Vinyl plank flooring captures the natural beauty of hardwood flooring’s grain tones and textures for a fraction of the price. Known for decades for easy installation and maintenance, vinyl is a very popular choice for high traffic areas because it is waterproof and scratch and stain resistant. It comes in strips, which are available in a large selection of styles and designs, including exotic and domestic wood. 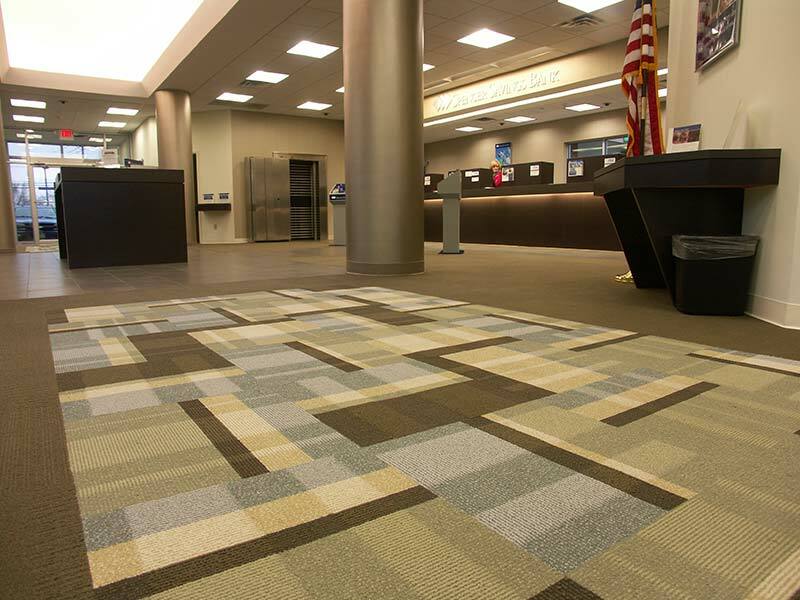 Many vinyl strips are lined with a layer of felt for a softer, more comfortable floor. It can be installed right on top of your subfloor, making installation is cost-effective and quick. Vinyl flooring lasts about 20 years, giving you several decades of beautiful, easy-to-clean, durable flooring. If you are trying to achieve the hardwood look but need a more economical option, laminate flooring is a smart choice. Modern laminate flooring is much more sophisticated than older versions. It can give you virtually any look you want, from any variety of wood finishes to funkier styles like metal or polished concrete. Laminate is made from pressed wood, is highly durable and scratch-resistant, and can last for up to 50 years. On average, the cost to install laminate flooring is approximately 50 percent less than that of hardwood. At Speedwell Design Center, our talented flooring experts can help you determine which type of hardwood flooring is best for your home and lifestyle. 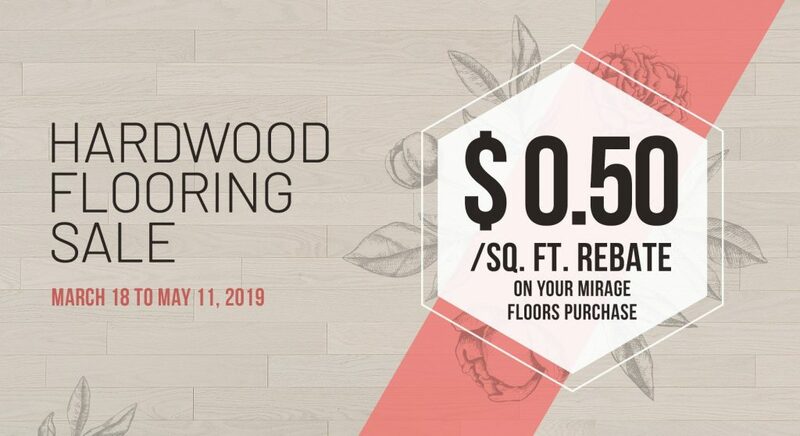 We always BEAT THE CHAIN STORE’S PRICES on hardwood flooring, and our experienced, friendly craftspeople can have your floors beautifully installed in no time. We have been proudly serving the community for over 80 years with quality professional services, expert design advice, and brand name products while keeping your satisfaction as our highest goal. Stop by our showroom today for a consultation with a hardwood flooring specialist to determine which type of flooring is best for your home. Contact Us About The Mirage Spring 2018 Rebate Sale. Valid on all standard hardwood floors listed in the current Mirage product chart and on the Mirage website regardless of species, color, or width. Flooring must be purchased between April 16 and June 9, 2018, at 11:59 p.m. (EST). Claims and supporting documentation sent by email or regular mail must be postmarked or date stamped no later than July 21, 2018. Ask a Speedwell Design Center Consultant for rules and details today!